As the largest independent funder of Motor Neurone Disease research in Australia, FightMND’s vision is a world without MND. Integral in this vision is our determination to help facilitate the translation of the growing body of new knowledge about the disease into a cure for MND patients in Australia and abroad. On March 1, 2019, FightMND announced it will commit another $7.6 million into seven new MND research projects. Projects were assessed by a panel of both national and international MND experts and the specific research projects selected can be viewed by clicking the button below. To help deliver these potential therapies to MND patients through the provision of access to clinical trials within the FightMND Clinical Trials Consortium. clinicians and patients through funding development of homegrown drugs from our labs into clinical trials for Australian MND patients. See below for more details about the four clinical trials that FightMND have funded that are currently underway. The “Tecfidera in ALS” (TEALS) study is the largest Australian-run clinical trial in MND/ALS. The study is a Randomized Double-Blind Placebo-Controlled Phase II Trial which will test the safety, tolerability and efficacy of the drug Tecfidera in up to 150 MND patients. The trial is being headed by Professor Steve Vucic and Professor Matthew Kiernan at the University of Sydney. The Phase 1b clinical trial of IC14 as a potential treatment option for Motor Neurone Disease (MND) began in 2017. The trial is a small study being run at the Royal Brisbane and Women’s Hospital that assess the safety and tolerability of the drug IC14 in 10 MND patients. The IC14 trial is supported by FightMND in partnership with Implicit Bioscience. In 2016, FightMND funded the “Lighthouse Trial”, a Phase 2 pilot clinical trial of combination oral anti-retroviral therapy as a potential treatment option for Motor Neurone Disease (MND). Excitement about the possibility of this targeted therapy has grown in recent times due to strong scientific evidence in both humans and recent pre-clinical animal studies. An overview of the research that has been performed to date, the rationale for why this compound may be an effective treatment, and the status of the clinical trial is briefly summarized here. 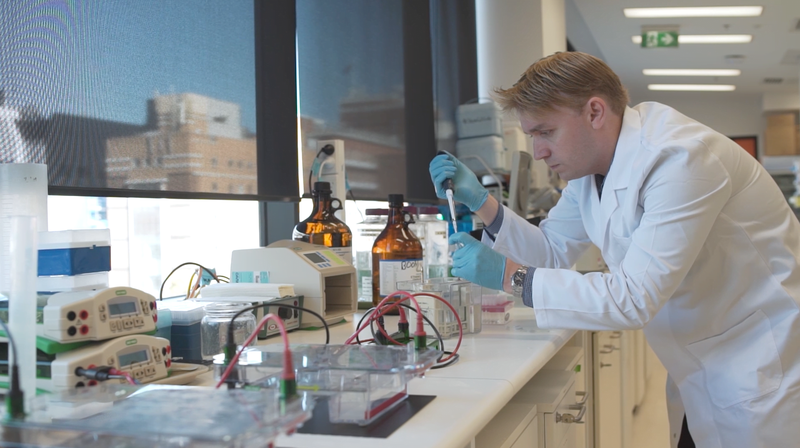 In 2016, FightMND partnered with a USA company called Collaborative Medicinal Development (CMD) to run the first Phase 1 clinical trial of the drug, Copper-ATSM (Cu-ATSM) as a potential treatment option for Motor Neurone Disease (MND). Cu-ATSM therapy was developed in Melbourne Australia, and the trial is a true example of Australian scientific ingenuity and innovation. Researchers are very excited by the basic scientific work and the pre-clinical trials and data that led to this first-in-man clinical study in Australia. In addition to funding Clinical Trials, FightMND supports Research Projects to help progress potential new treatments through the stages of drug development so they can be tested in clinical trials. The projects are funded through our Drug Development Grants. A/Prof Trent Woodruff's project is focused on bringing a novel drug for MND called PMX205 into the clinic. PMX205 targets the immune system to try to slow the disease progression in MND. Prof Perry Bartlett's project is focused on developing a new drug, mEphA4-Fc, so that it can be tested in MND patients in a clinical trial. mEphA4-Fc targets motor neurones and keeps them functioning in disease. A/Prof Bradley Turner's project will test a drug that targets a biochemical pathway that is important in the metabolism of specialised lipid cells called ``glycospingolipids`` which are essential for motor neurone function and survival. A/Prof Peter Crouch's project will investigate whether a combination therapy of the drug CopperATSM and a novel drug that regulates iron levels is protective against MND. A/Prof Atkin was been awarded two FightMND Drug Development Grants for two different projects aimed at developing new treatments for MND. Prof Tracey Dickson's project aims to determine if a drug that mimics the action, Neuropeptide Y, of specialised inhibitory cells can treat MND. The aim of this program is to rapidly find potential treatments for Motor Neurone Disease. We are using award-winning technology allowing us to grow motor neurones from patient cells. Our inaugural MND Research Symposium was held in Melbourne in March, 2018. Stay connected with us for more details regarding the next MND Research Symposium. Connect. Collaborate. Inspire. The Foundation has gathered leading MND researchers, neurologists, and experienced clinical trials physicians from Australia and abroad to lead our drug development program and research grant process, and to help facilitate the roll out clinical trials in Australian MND clinics. Researchers working in areas relevant to improving the translation of/or progressing the development of potential therapies for Motor Neurone Disease (MND) are invited to apply for funding to support research projects commencing in 2019. We are pleased to announce a call for the following FightMND Research Grants. These grants support Phase II/III clinical trials of novel, high-potential treatments for MND/ALS within the Australian Clinical Trials Consortium. These grants are awarded with an offer of AUD $500,000 – $1,000,000 (Phase II trial) up to $1,500,000 (Phase III trial) with a project performance of up to 3 years. Eligibility: Applications are open to MND/ALS researchers globally. Australian trial sites mandatory. 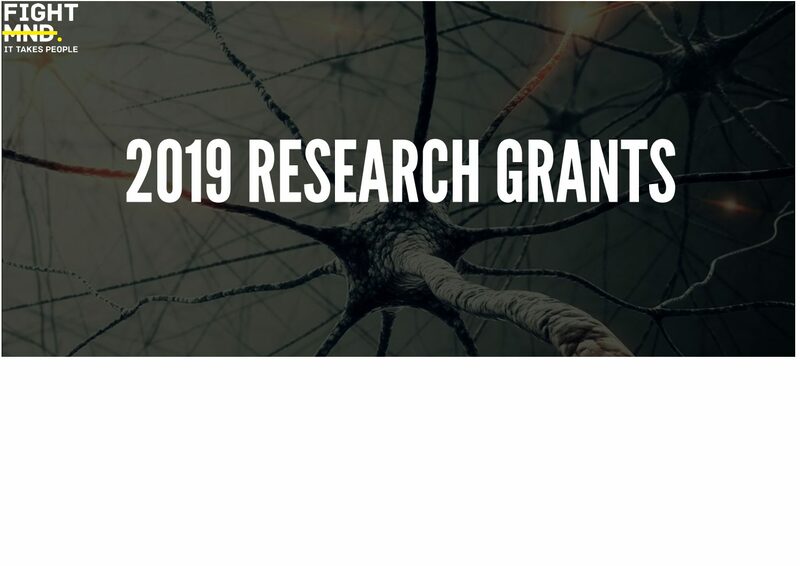 These grants support the preclinical research, development and assessment of therapeutics for MND/ALS through to (and including) completion of Phase I clinical trials. These grants are each awarded with an offer of up to AUD $1,000,000 in support available for 3-year projects (Projects with a period of performance of less than 3-years will also be considered). Eligibility: Applications are open to MND/ALS researchers globally. These grants are for support of 2-year projects up to the value of AUD $250,000. Proposals for both discovery and translational research stages will be considered. Eligibility: Applications are invited for research based in institutions within Australia. Investigators at all academic levels are eligible to submit applications. Please note that applicants are limited to one (1) CIA and two (2) Co-CIA applications for this grant scheme. This Fellowship will support mid-career researchers (5 – 12 years following award of their PhD) to lead a research project aimed at understanding the causes of MND/ALS, elucidating disease mechanisms and facilitating the translation of therapeutic strategies from the laboratory to the clinic. A total of AUD $100,000 per annum for support of a 3-year full-time Fellowship, with an overall maximum of $300,000 for a 3-year award. Proposals for both discovery and translational research stages will be considered. Eligibility: Applications are invited for researchers based in institutions within Australia. Applicants must have completed their PhD within 5 – 12 years at the time of application. This Fellowship will support early-career researchers (within 5 years following award of their PhD) to lead a research project aimed at understanding the causes of MND, elucidating disease mechanisms and facilitating the translation of therapeutic strategies from the laboratory to the clinic. Eligibility: Applications are invited for researchers based in institutions within Australia. Applicants must have completed their PhD within 5 years at the time of application.